Formerly known as Burma, Myanmar is known throughout the world as the Golden Land because of its many golden temples which adorn its countryside. 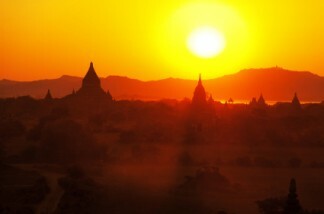 Golden Myanmar takes you on an unforgettable journey through this mysterious land rich with culture which lives in its many songs and folktales. It is said that the map of the country itself resembles the figure of a dancing lady. Begin in Yangon and visit Shwedagon Pagoda, Chaukhtatgyi, and Kandawgyi Lake famous for its Karaweik. Fly to Mandalay and tour Amarapura, once a capital city. Visit Maymyo (Pyin Oo Lwin), a former British hill station. Explore Bagan in a hot air balloon and take a boat ride down Inle Lake to see its floating gardens. Bustling markets and lunch at an Intha family’s home give you an in depth look at Myanmar’s people. Golden Myanmar is a precious as the valued metal it is named for! Transfer to the airport for your flight to Yangon. You will be met and driven to your hotel upon arrival. The rest of the day is free for you to shop or relax. Overnight at Chatrium.